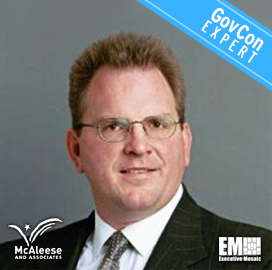 Consulting firm McAleese & Associates has released a report on key takeaways from the speeches of Air Force Secretary Heather Wilson and Will Roper, the service’s acquisition chief, at an Air Force Association symposium that kicked off Thursday in Orlando, Fla.
Wilson discussed the need for the service to dominate time, space and complexity by advancing science and technology across five areas: resilient information sharing; global persistent awareness; complexity in mass; speed and reach of disruption and lethality; and rapid decision making. 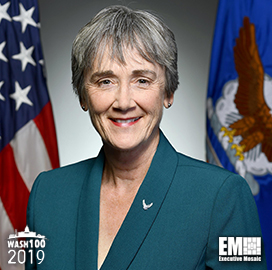 She said the Air Force should create multiple dilemmas for adversaries and dominate tech areas such as artificial intelligence, hypersonic offense, directed energy, electronic warfare, cyber and offensive space, Jim McAleese, founder and principal at McAleese & Associates and a 2019 Wash100 winner, wrote in the report. She noted the military branch should tailor its acquisition strategies and advance agile software development to speed up the deployment of capabilities to warfighters. 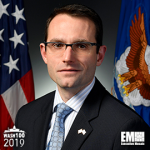 Roper talked about the Section 804 middle tier acquisition and the need for the Air Force to update its software acquisition process and advance prototyping in order to keep design teams alive. He said the service should fund modernization through sustainment cost reduction and help build up the industrial base to compete with potential adversaries, according to the report. Other topics Roper discussed at AFA’s Air Warfare Symposium include the service’s upcoming pitch day in New York for startups; the Mad Hatter project to help address issues with the F-35 Autonomic Logistics Information System; and the Ground Based Strategic Deterrent program. Wilson and Roper are both 2019 Wash100 recipients.